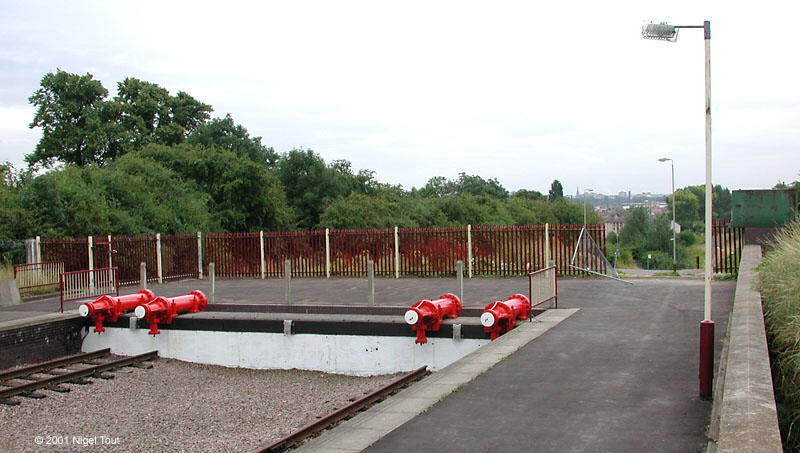 This section covers the line from Leicester North station southwards to Beaumont Leys Lane. The Great Central Railway’s new Leicester North Station with Britannia 4-6-2 70013 “Oliver Cromwell” having just arrived from Loughborough during the Winter Steam Gala in 2010. The island platform of the original station was located to the right of the train, where the run-round loop is, and was accessed from stairs leading down from the bridge in the background. Leicester North Station with “Black 5” 5-MT 4-6-0 45231 “The Sherwood Forester” awaiting its next turn of duty during the Winter Steam Gala in 2010. Originally the tracks continued south, beyond the buffer stops to Leicester Central station and on to London Marylebone station. 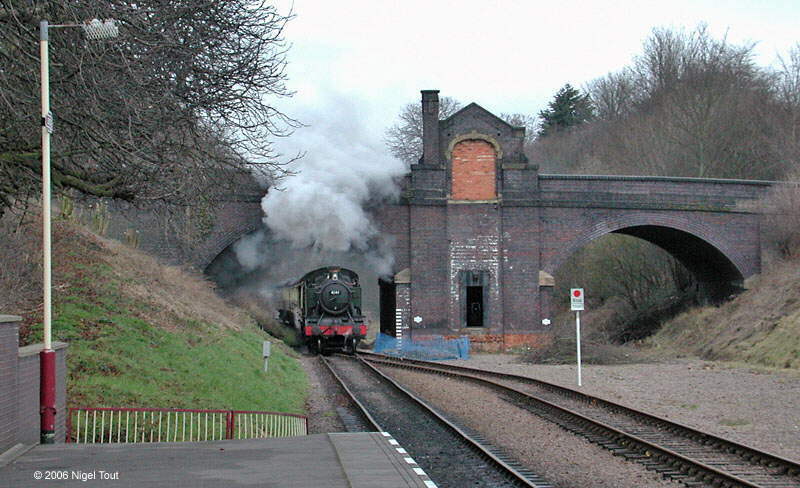 A train from Loughborough hauled by ex-GWR 2-6-2T 4141 passes under Station Road Birstall, with the remains of the entrance to the demolished Belgrave & Birstall station, as it approaches Leicester North station. Looking south over the buffer stops of Leicester North station towards the approach road. The track originally carried on here leading on to an embankment. Looking south down the approach road to Leicester North GCR station, 50 yards south of the photograph above. This is a new road, called The Sidings, with a junction from the Leicester Outer Ring Road, and was constructed after removal of the railway embankment. 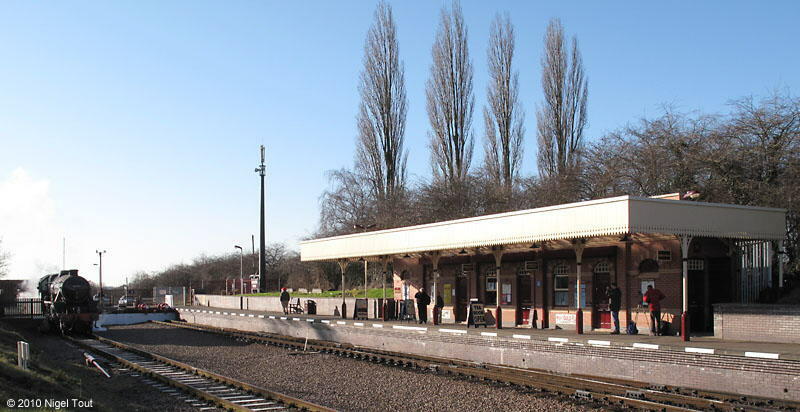 The entrance on the left leads to the Greenacres site, with the “Platform” restaurant, where the station master’s house used to be. The footpath leading off at centre left to a bridge over the Ring Road follows the route of the original road to the house. Following the footpath across the bridge over the Outer Ring Road, looking south. 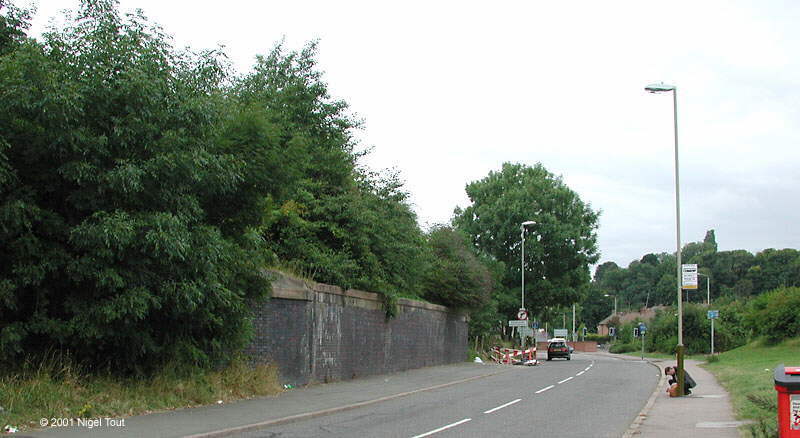 The embankment carrying the railway was parallel to this bridge and is marked by the lighter green area on the far side of the road, with a circular pattern of stone blocks. Note that in 2015 the pattern of stone blocks was hidden by the growing vegetation. The junction of the approach road to Leicester North station can just be seen at bottom right. 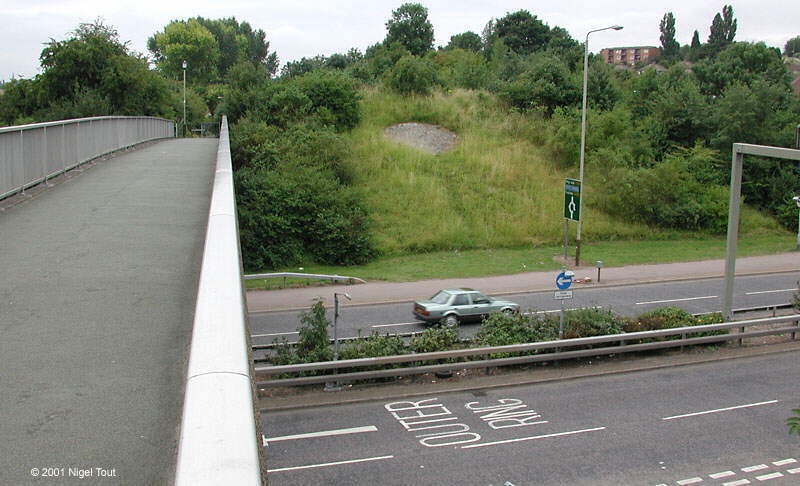 The only remains of the brick bridge across Thurcaston road, looking North West towards Thurcaston (this road is now cut by the new course of the Outer Ring road). The footpath from the footbridge shown above comes down from the right. The track bed at the top of the embankment to the south of Thurcaston road, looking south. 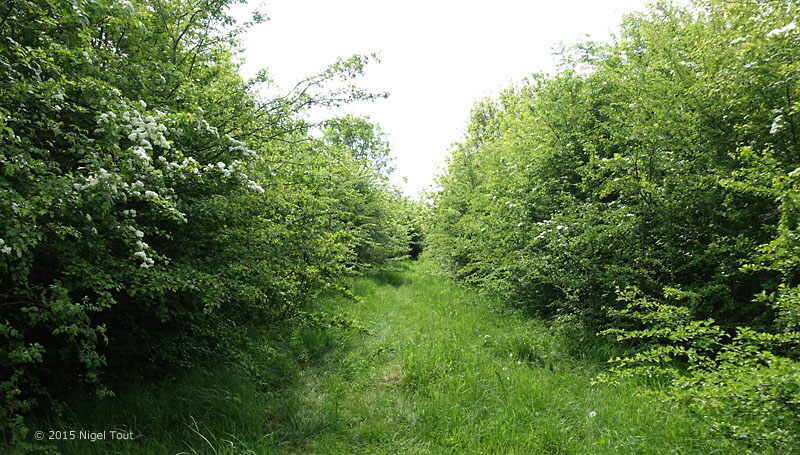 The embankment is intact for about half a mile to beyond Beaumont Leys Lane but is very overgrown in places. Although not apparent from the photograph this part of the route passes through a high-density housing estate. 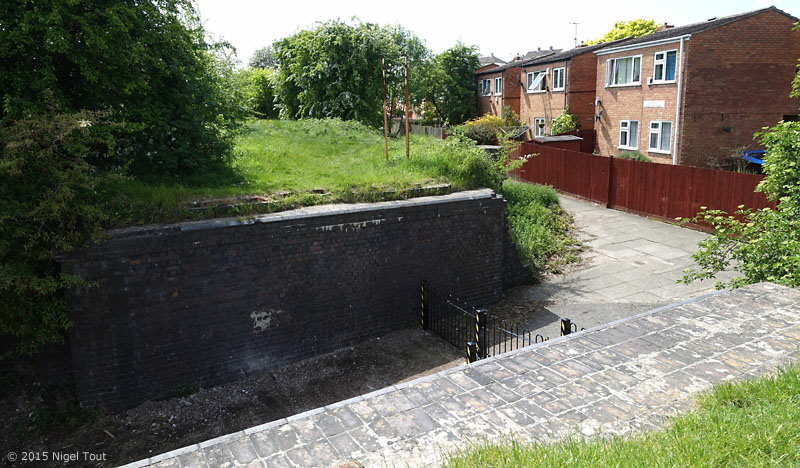 The houses and flats are well below the high embankment and are obscured by the bushes. The remains of the brick bridge across Millbrook Walk, which links Millbrook Close and Greystoke Road, looking south. Planning applications have been submitted to redevelop the trackbed around here with housing, a linear park, and footpath/cycleway, but have been rejected.